Andrew, the first Apostle. A fisherman by trade and brother of Simon Peter. Andrew went through life leading people to Jesus, both before and after the Crucifixion. He was a missionary in Asia Minor and Greece, and possibly areas in modern Russia and Poland and was martyred on an saltire (x-shaped) cross. He is said to have preached for two days from it. Some peculiar marriage-related superstitions have attached themselves to St Andrew’s feast day. 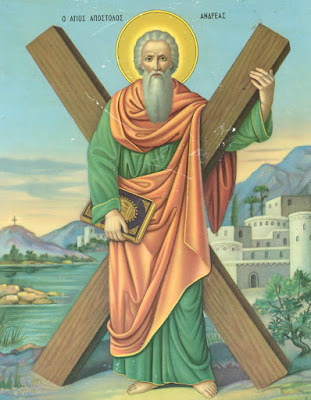 An old German tradition says that single women who wish to marry should ask for Saint Andrew’s help on the eve of his feast, then sleep naked that night; they will see their future husbands in their dreams. Another says that young women should note the location of barking dogs on Saint Andrew’s Eve: their future husbands will come from that direction. On the day after Andrew’s feast, young people float cups in a tub; if a boy‘s and a girl‘s cup drift together and are intercepted by a cup inscribed “priest”, it indicates marriage.